The Deer Tracks :: Multidimensional Model of Emotion. The concept of emotion is applicable to all evolutionary levels and applies to animals as well as to humans. Emotions have an evolutionary history and have evolved various forms of expression in different species. Emotions served an adaptive role in helping organisms deal with key survival issues posed by the environment. Despite different forms of expression of emotions in different species, there are certain common elements, or prototype patterns, that can be identified. There is a small number of basic, primary, or prototype emotions. Primary emotions are hypothethical constructs or idealized states whose properties and characteristics can only be inferred from various kinds of evidence. 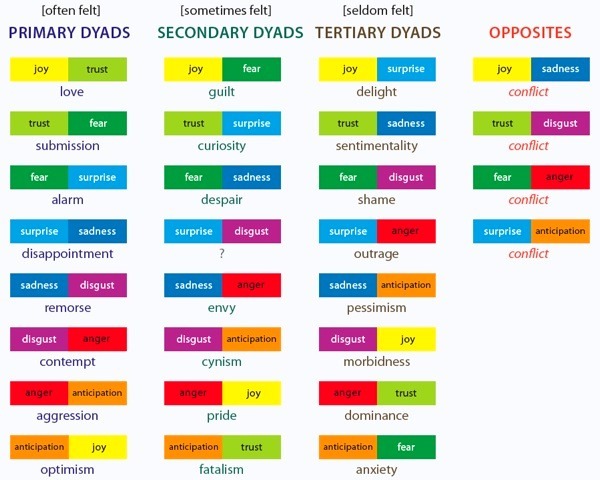 Primary emotions can be conceptualized in terms of pairs of polar opposites. All emotions vary in their degree of similarity to one another. Each emotion can exist in varying degrees of intensity or levels of arousal.